Within the gardens, summer still lingers. The annuals are still putting on a display, albeit not as floriferous as 2 weeks ago. 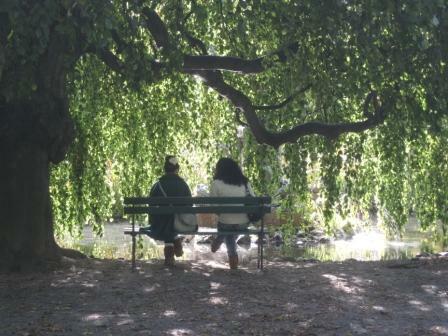 The trees have barely begun to turn, but the paths are relatively quiet. The Uncommon Grounds however was pretty busy, with most people sitting outside enjoying our lovely weather. 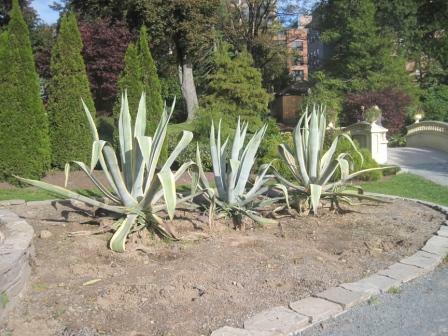 The tender tropicals are being moved indoors, and the annuals in the Tropical Display/Cacti Bed have been removed. Time to start planning for winter, and book a vacation in the sun! Hibiscus, Cacti, Agaves and Musa occupy their winter home . 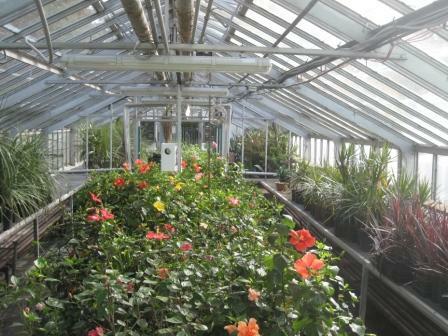 Being inside a greenhouse on a cold winter’s day is lovely. It’s not as nice as going south, but it’s a wonderful break! 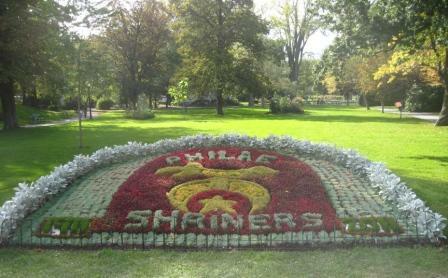 Commemorating 100 years of the local Shriners. Carpet beds have long-lasting displays which last well into fall. 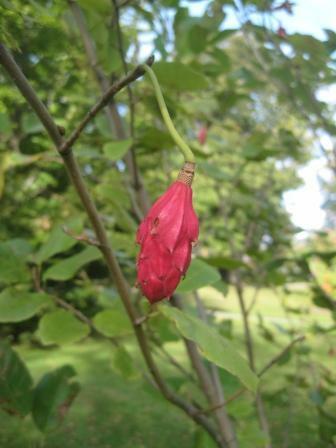 Leaves and berries aren’t the only plant parts worthy of admiration during the fall. The fruit hanging on this Magnolia tree resemble Christmas ornaments. Another attention grabber! 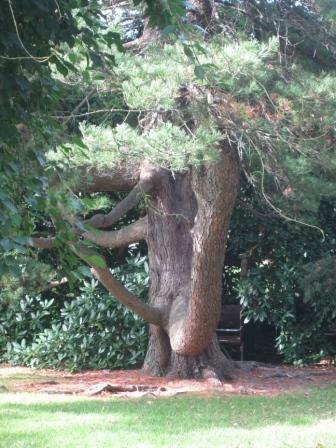 This Pinus cembra (Swiss stone Pine) has a hug crook in its second trunk. 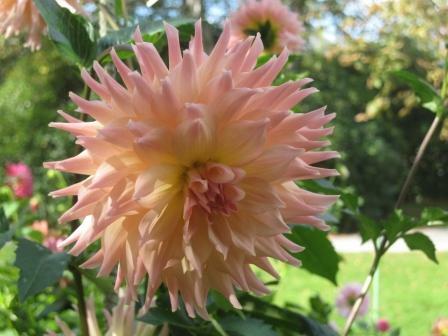 An odd name for a very pretty Dahlia ‘Mingus Selena’. I keep expecting the frost to hit and end the spectacular Dahlia display, but they keep on trucking! 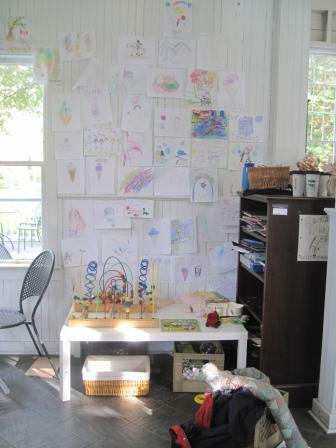 Art and ice cream at the Uncommon Grounds cafe. A bright, cheerful corner where the kids can take a break from chasing the ducks. 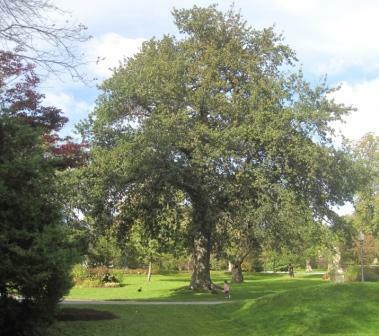 This majestic Quercus (Oak Tree) donated by King George, can be found next to the statue of Ceres. 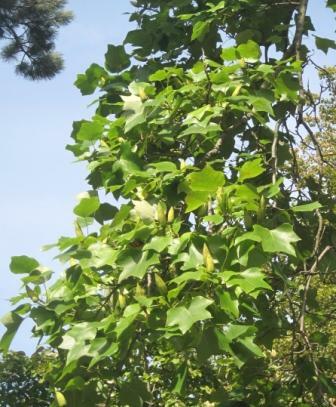 As the name suggests, the Liriodendron tulipifera (Tulip tree) is covered in stemless tulip-like flowers in mid to late June. All copy and images copyright © Serena Graham-Dwyer, 2011. If you wish to use any part or whole of an image, in any manner, please contact us. This entry was posted in photo tour and tagged agave, carpet beds, dahlia, greenhouse, liriodendron tulipifera, magnolia, pinus cembra, quercus, uncommon grounds by friendsblog5665. Bookmark the permalink.